The Seabees, officially known as Naval Construction Battalions ("CB"), were originally organized from civilian volunteers recruited from the construction trades. They were responsible for constructing and maintaining forward naval bases throughout the Pacific War. Their official motto, Construimus batuimus ("We build, we fight") was supplemented by the unofficial motto "Can Do", or, in more cynical moments, "First We Build 'Em, Then We Die In 'Em." Prior to the outbreak of war, the Navy had been accustomed to using civilian labor under contract for base construction. However, following the loss of Wake (where hundreds of civilian construction workers were trapped on the island and fell into Japanese hands), Rear Admiral Ben Moreell, Chief of the Bureau of Yards and Docks, asked for authority to raise a Construction Regiment of three Construction Battalions. Unlike civilians, who lacked protection under international law if they were captured by the enemy, these men would be inducted into the Navy. Moreell was granted authority on 5 January 1942 to begin recruiting men for the battalions. The First Naval Construction Battalion was organized by the end of the month and deployed to Bora Bora as part of Operation BOBCAT in February 1942, where it rapidly constructed a tank farm for refueling Navy task forces. Initially the Construction Battalions were commanded by line officers of the Navy, as required by Navy regulations. On 19 March 1942 these regulations were amended to permit Civil Engineer Corps officers to exercise command authority over Construction Battalions, and from then on the officers of the Construction Battalions were men who were knowledgeable in the relevant skills. The Navy also relaxed its rules on rates, allowing experienced foremen to enlist as chief petty officers. 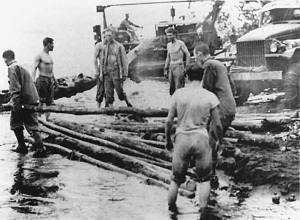 There was some concern from unions that the Seabees would be used to break strikes on Naval construction work in the States, but the Secretary of the Navy assured the unions that Seabees would be used within the country only if unforeseen emergencies arose, and the unions acquiesced. Some 80% of Seabees enlisted early in the war were union members. Because the Seabees were initially recruited from men already knowledgeable in the construction trades, their training emphasized basic military skills rather than engineering skills. This was often quite perfunctory early in the war and took place at former National Youth Administration camps. Physical fitness requirements were more relaxed than for other branches of the armed forces, and the average age of a Seabee was 37. The upper age limit was theoretically 50, but it was later discovered that some men over 60 years of age had found their way in. Because the Seabees were originally older volunteers, who sometimes required some inducement to sign up, their standard of living was one of the highest of any branch of the armed forces in the Pacific. This sometimes bred resentment from combat troops and Army service forces who had to make do with more primitive facilities. In addition, Seabees were sometimes accused of spending too much time setting up camp and not enough time building essential combat facilities in newly captured base areas. Nonetheless, their contribution to victory was incalculable, and E.B. Sledge fondly remembered the Seabees at Pavuvu looking the other way when Marines slipped into their mess lines for high-quality meals. In December 1942 President Roosevelt forbade any further voluntary enlistments, which were draining away too many of the most skilled workers required for the American wartime economy. Thereafter Seabees were selected from draftees, who were much younger and rarely had significant training in the construction trades. Training emphasis shifted accordingly, and the Seabees soon had their own training camp at Camp Endicott, Rhode Island. Ultimately the Seabees would have seven bases of their own, including a depot at Port Hueneme. Training consisted of three weeks of basic training at Camp Allen, in Virginia, followed by six weeks of specialized Seabee Training at either Port Hueneme or its Atlantic counterpart at Davisville, Rhode Island. Most of the older Seabees, who in spite of their invaluable contributions had proven unable to meet the physical demands of round-the-clock work in an unhealthy environment, were returned home and discharged back into the civilian economy. By the end of the war, 151 regular construction battalions had been raised, along with 39 special construction battalions and numerous smaller detachments and special units. These were organized into 54 regiments, 12 brigades, and 5 naval construction forces. Over 325,000 men served in the various Seabee units. Organization. A typical Naval Construction Battalion consisted of 32 officers and 1073 men organized into four companies. Where necessary, Construction Battalions could be organized into Construction Regiments or Construction Brigades, while Construction Detachments could be assigned to smaller jobs. Over sixty construction trades were represented, along with unofficial wartime specialties such as souvenir counterfeiting and moonlight requisitioning. Beginning in the fall of 1942, special naval construction battalions were raised to act as stevedores, loading and unloading ships in remote areas. These battalions each had 34 officers and 1010 men and could unload over 30 ships per month. There were also Construction Battalion Maintenance Units of 60 to 250 men organized to maintain facilities behind the combat zone. For a time, a Construction Battalion was assigned to every Marine division as part of its engineering regiment. This proved awkward since the Seabees were not Marines and had not been trained in the Marine tradition of "every Marine a rifleman", and the Construction Battalions were removed from the Marine TO&E. However, Seabees continued to be a part of almost every amphibious assault.